Hatters’ players were disappointed not to leave the Abbey Stadium with all three points on Saturday according to midfielder Luke Berry. The 25-year-old, who was going back to his former club for the first time since leaving to join Luton back in August, had seen Town move 1-0 ahead through James Collins in the first half. You say a draw away is not a bad result, but we’re disappointed in there. 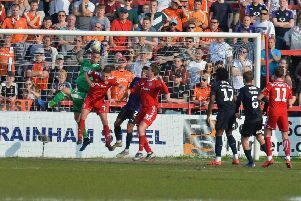 However, Collins was then sent off with 13 minutes to go, as Jabo Ibehre equalised moments after coming on, as Luton were held to their second successive draw. Berry said: “I think the feeling is we’re quite disappointed about the result. “We looked in control, I don’t know what time the sending off happened, but we felt we could have got one, two, three, four. “That (red card) affected us, you see the crowd get up and they were all going for it, so you say a draw away is not a bad result, but we’re disappointed in there. “I thought we did well to dig out a draw last week (against Cheltenham) and this week we’re just disappointed not to take the three points and hold on. “We’ll talk about it Monday, Tuesday and then we’ve got a big game next week. Luton had been under the cosh for the opening 10 minutes, before growing into the contest and were clearly the better side for long periods. Berry continued: “You could see they started really well, they were on the front foot, they were giving it a right go. Then you could see our structure was starting to show and we got on the ball. “It was a good goal from us, then second half, same sort of thing, we weren’t unbelievable, but we were in control, keeping the ball well. “That (Collins’ dismissal) affected us when it happened, but we shouldn’t really concede, we should sit in, but those things happen. Boss Nathan Jones was frustrated by the manner of the equaliser too, adding: “We’ve got beaten at the back stick, we have to adjust, we can’t get beaten in between people. “It’s just frustrating, but the sending off changed the game.